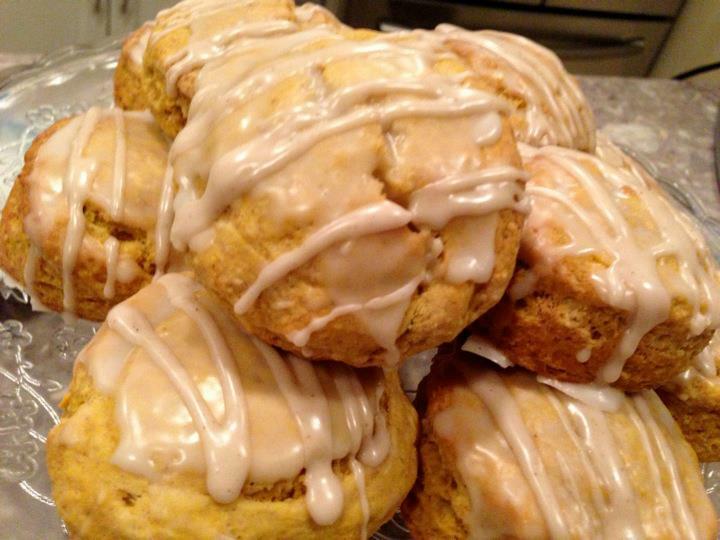 Simply the most wonderful Pumpkin Scones! It is that time of the year again; Pumpkin Lattes will be available at Starbucks, not that I ever go there but I do walk by their shops from time to time and they smell absolutely amazing with all the beautiful Fall spices! Brings to mind visions of beautiful orange, yellow and brown Maple leaves drifting to the ground. The crunch of said leaves under foot along the many beautiful trails in beautiful British Columbia…hey, that is what it says on the license plates! There is a crispness in the air and we are driven to thoughts of curling up in front of our fireplaces with a good book, a cup of good coffee and something yummy to nosh on. This Spiced Pumpkin Scone recipe I found last year fits the bill to the T! These scones are lightly adorned by not one, but two delectable glazes. Got your mouth watering? Get thee to the kitchen and get cracking on your own Spiced Pumpkin Scones! In large bowl combine flour, brown sugar, baking powder, baking soda, salt and all the spices. Using a pastry blender or two knives, cut in cold butter until mixture resembles coarse crumbs. In a small bowl or a large measuring cup whisk together pumpkin puree, molasses, half and half, vanilla and egg. With a fork stir pumpkin mixture into flour mixture just until a soft dough forms. Gently knead about 10 times. 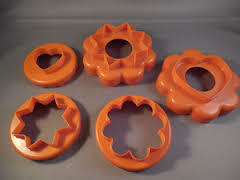 Tupperware Fluted Cookie Cutter to cut out scones. Place on prepared baking tray and bake for 10 – 15 minutes or until golden brown . While scones are cooling prepare your glazes. In small bowl stir together icing sugar and half and half to desired consistency. Load into a Ziploc Freezer bag or a Piping Bag with a small writing tip . In small bowl combine icing sugar, pumpkin puree, spices; add 1 Tablespoon half and half and stir, adding more half and half to get desired consistency. Load into another Ziploc Freezer bag or Piping Bag fitted with a small writing tip. Drizzle first one glaze then the other over the scones. Let glaze set for about 15 – 20 minutes. These look fantastic. Thanks so much for sharing 🙂 Love your photo, too!